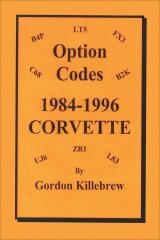 Written by longtime NCRS member Gordon Killebrew who served as Technician at the Bowling Green Corvette Assembly Plant for many years. This is the COMPLETE list of option codes produced by the plant. Do you have some "unlisted" option codes on your car? They can be deciphered using Gordon's information. Neat stuff. Softbound, 22 page booklet. This product was added to our catalog on Monday 21 March, 2011.